I’m feeling self-indulgent today, so I think I’ll fill out this food survey that I found before I tell you about these enchiladas. Dasani, Aquafina, Evian? Don’t care. Trident, Dentyne, Crest? Are these gum or tooth paste questions? I am confused. Dark Chocolate, Milk Chocolate, White Chocolate? Dark Chocolate. Sobe, Gatorade, Powerade? Powerade, though I rarely consume such beverages. What do you absolutely refuse to eat? Pickled Herring. The most disgusting thing you have ever eaten? Chicken with 40 Cloves of Garlic, in the slow cooker. This incident occurred junior year of undergrad (one of the now-huz’s cooking endeavors), and to this day I am afraid to put garlic in any slow cooker dish. Scarred for life. I also despise stale, wilted baby greens. They are disgusting. Do you watch cooking or food shows? Top Chef; many Food Network shows. Do you know how to cook? Absolutely. When did you learn how to cook? I learned how to bake as a kid learned to cook as a teen and young adult. No specific age really..
What did you last eat for breakfast? I actually don’t eat breakfast. (Bad, I know.) Black coffee is my daily breakfast. What did you last eat for lunch? Amy’s Teriyaki Bowl, half of a Panera bagel with cream cheese I scrounged out of the office kitchen. What did you last eat for dinner? Blackened Salmon, Roasted Brussels Sprouts, Roasted Sweet Potatoes. Would you rather eat alone, with strangers, or with friends and family? With friends and family. I enjoy sharing dining experiences with friends and fam. Would you say you have good table manners? Absolutely. My mother taught me well. If you have pets, do they ever get table scraps? N/A. No pets. Ever eaten dog, cat, other animal food? Actually yes. I’ve eaten a milk bone before. I’m a freak. First thing you usually feel like eating when you wake up? Sausage Biscuit from McDonald’s but I only induldge this craving every couple years. Do you chew gum? Too much. Health food or junk food? Both. Are you overweight? I am not. My current BMI is 21.5, which is in the healthy range for my height. Have you ever been on a diet? I started strictly counting calories almost three years ago, gradually lost 35 pounds, and have kept 30 of those off, three years later, by remaining mindful of my daily calorie intake. Are you allergic to any kind of food? Nope. What’s your favorite pizza topping? Bacon. Pineapple. Banana Peppers. Green Olives. Organic or not? When organic produce is available and reasonably priced, yes. Especially for berries, greens, grapes, peaches, and other members of the Dirty Dozen. Are you vegetarian? I am not. Favorite Food? I could absolutely never choose. Probably anything involving cheese. Anything salty, including bacon, potato chips, french fries, green olives, and cheese and more cheese. Vegetable of the Year? Brussels Sprouts have won a dear place in my heart. Ever eaten spam? Not to my knowledge. Wow. 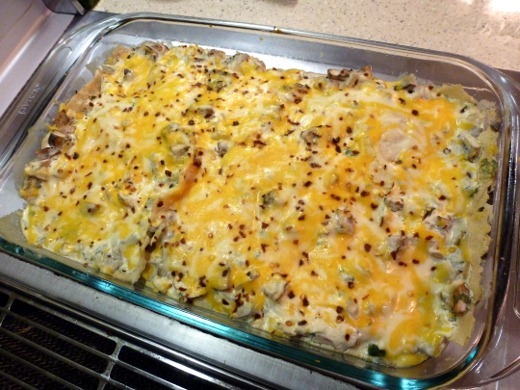 And now, as promised, here are those enchiladas! As has been frequently mentioned in this blog, my huz is rather carnivorous. Fortunately he is tolerant of my Meatless Monday endeavors. 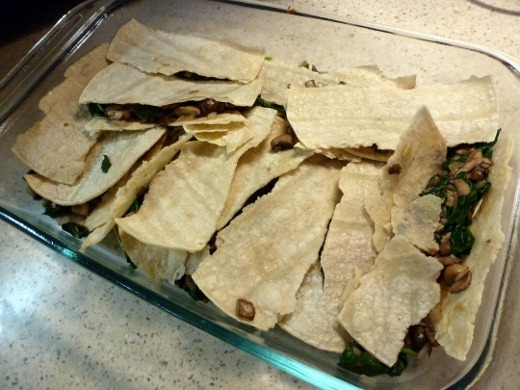 Last Monday I made these fabulous vegetarian enchiladas for dinner. 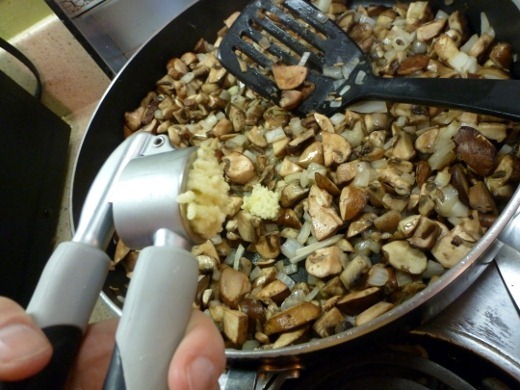 I used an entire pound of coarsely chopped baby ‘bella mushrooms! 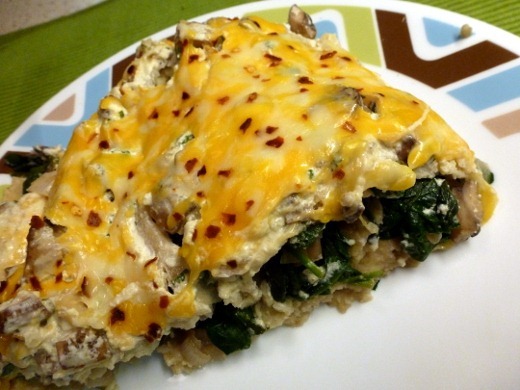 If you’re a mushroom fan, you will love this dish! Onion and garlic were invited to that shindig too! Then veggie broth showed up, and things just got buck wild. Spinach. TWELVE OUNCES. That is a lot of spinach, kids. 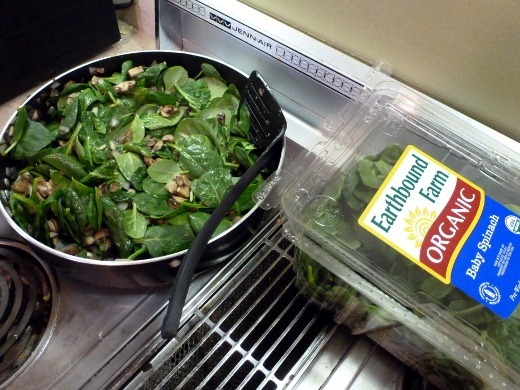 That’s only about 1/3 of the spinach in the pan below. Oh, I know you know that stuff wilts down to nothingness. Well, not nothingness. I mean, it’s full of nutrients. But in terms of volume. You got me. A couple burners away, this was happening. 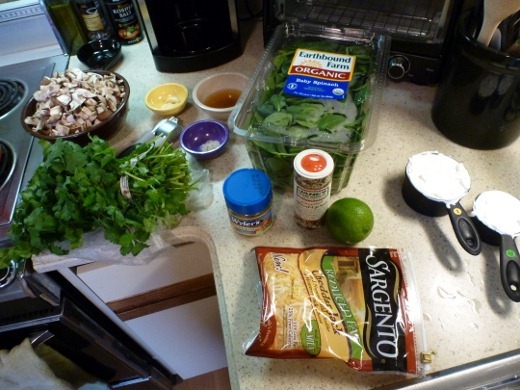 “This” is the preparation for the crazy creamy sauce that will later top the enchiladas. Half of the ‘shrooms for the sauce, half of the ‘shrooms for the filling. 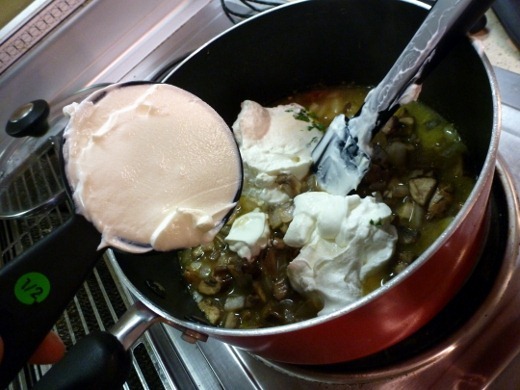 After adding a solid cup and a half of sour cream, you’ll wind up with a delicious, rich, creamy tangy sauce. Get some cilantro action in there. 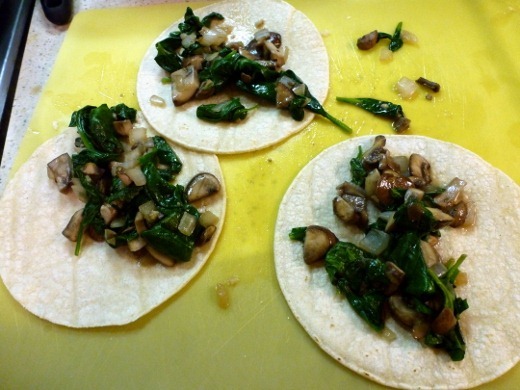 The mushroom and spinach mixture is then spooned into corn tortillas. Don’t even worry about rolling these up perfectly. Mine shattered to pieces but it was all good. Seriously. Don’t even fret about it. ..Because you’re just going to pour sauce all ova it! See, I got your back, friend. Cheese and red pepper flakes. These were pretty dang tasty enchiladas. A totally solid meatless option. 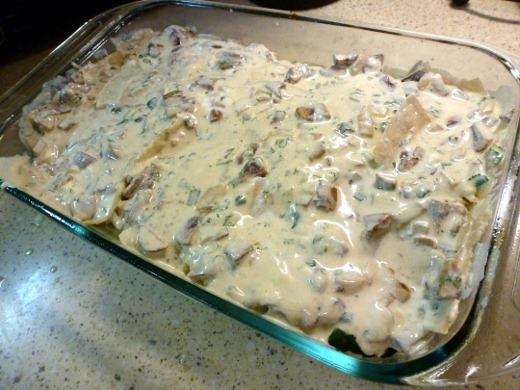 The gooey cheese on top is very comforting, and the creamy mushroom sauce is luscious and tangy, with a bite of fresh lime. 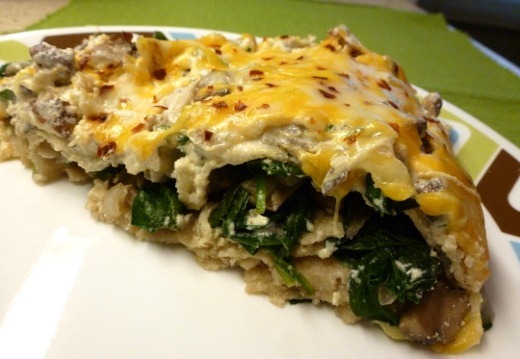 The mushrooms filling is meaty and delicious. Huz ate ‘em right up, with me. On the side, we had a scoop of Black Bean Salad. 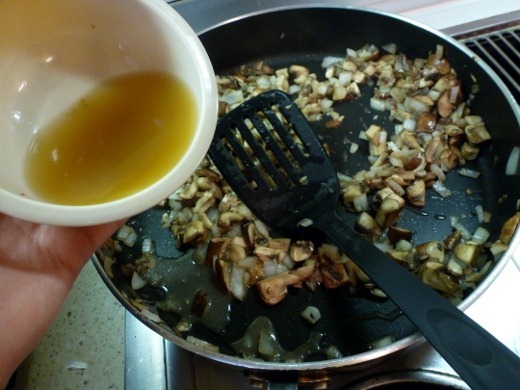 In a large skillet, sauté mushrooms and onion in butter until tender; add garlic, cook 1 minute longer. 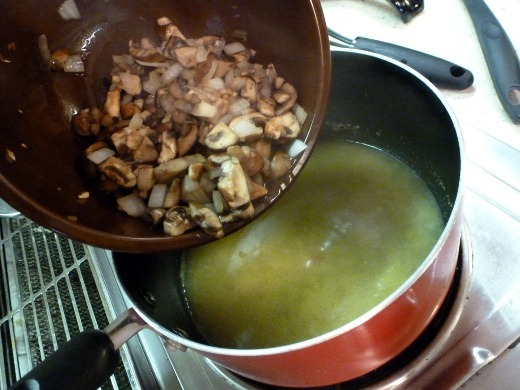 Set aside half of the mushroom mixture for sauce. 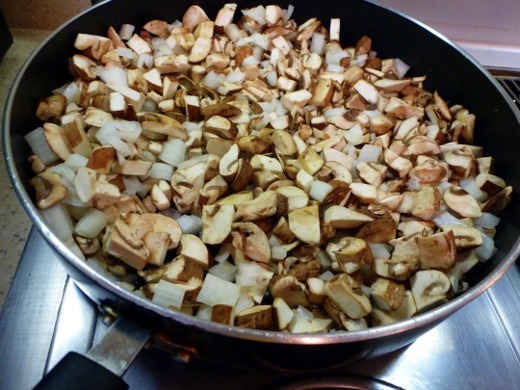 Add wine (or broth) to remaining vegetables; cook and stir for 2 minutes. 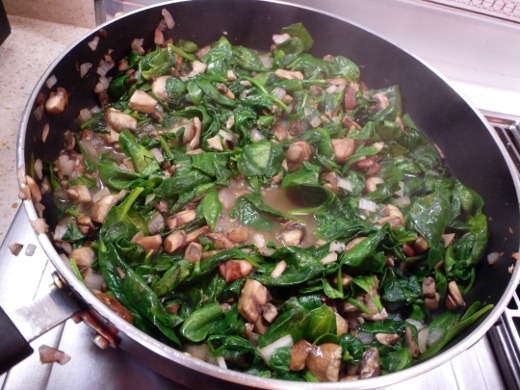 Add spinach and 1/4 teaspoon seasoned salt; cook until spinach is wilted and liquid is evaporated. 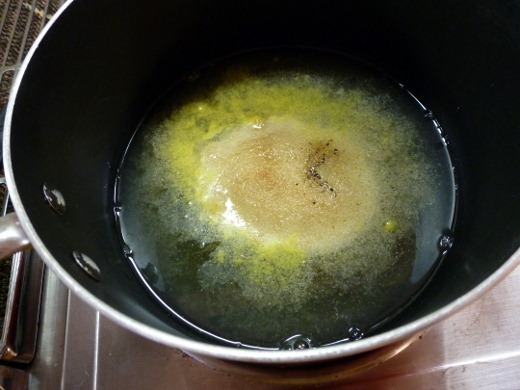 In a large saucepan, bring the water, lime juice, chicken bouillon, garlic powder and remaining seasoned salt to a boil, stirring to dissolve bouillon. 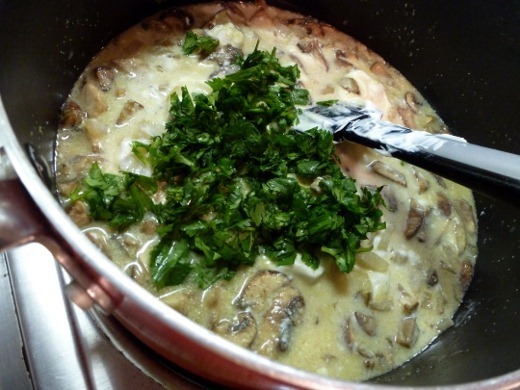 Stir in the sour cream, cilantro and reserved mushroom mixture; heat through. 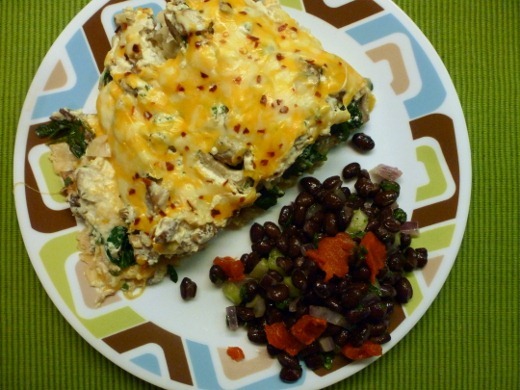 Place a scant 3 tablespoons spinach mixture down the center of each tortilla; roll up and place seam side down in a greased 13-in. x 9-in. baking dish. 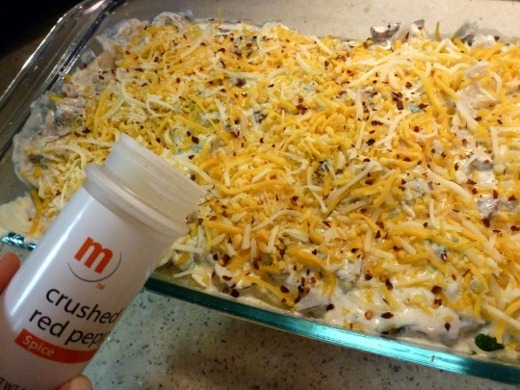 Spoon sauce over top; sprinkle with cheese. Bake, uncovered, at 350° for 14-18 minutes or until heated through. Sprinkle with pepper flakes if desired.